As many other companies Alcatel produced several phones on one platform. In my opinion, Alcatel 535 which is became a base of 735 is the best phone in its class. New model has the best features of 535, besides, it has an integrated camera. We will not talk about form-factor and functionality of the phone in this review. You can read it in Alcatel 535 review, features of these phones are the same. Now we'll speak about really new capabilities. It's logical that this handset has another color, following the last tendencies, the phone has an aluminum cover. Camera and a small mirror to take pictures of yourself are located on the back of the cover. Right soft key is used to access camera, it doesn't have any functions in the previous model. 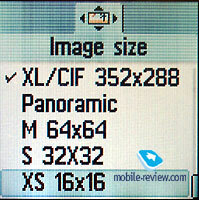 The camera has a resolution of 352х288, 128х128, 64х64, 32х32, 16х16 pixels, also there is a possibility to make panaromic pictures. In this case pictures are stretched across. 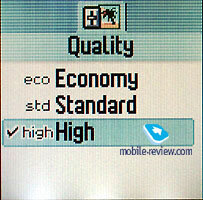 Photos are saved JPEG format, three types of quality are available (high, standard, economic). Phone's screen is used as a viewfinder. Interface is well though out. You can change almost all settings in the shooting mode using only several pressures. 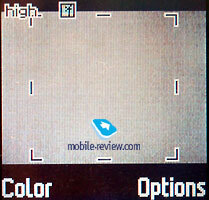 For example, such keys as 1, 2, 3 are responsible for the quality of the image. 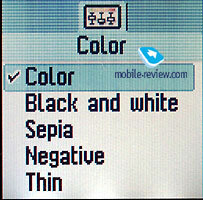 Left soft key can be used to select a color (color picture, black-and-white, Sepia, Negative, thin and Counters). 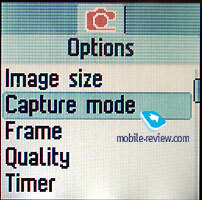 The key "#" allows to switch resolution of the images; * is responsible for special modes. There are several of them in the phone. One of them allows to create GIF file from 4 images. You can take 4 pictures and make an animated one from them on your phone. Only one resolution is available here, namely 128х128 pixels; it's obvious that developers tried to save a memory. It is a unique function, it varies phone's features. Other manufacturers haven't offered something of that kind yet. 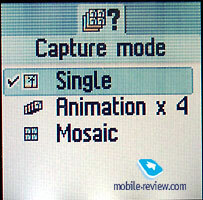 The second special mode is Mosaic. 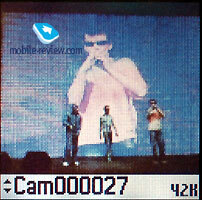 You could take 4 pictures (64x64 pixels) and create one large photo (128х128 pixels) from them. There is a timer to shoot with delay. I can't judge whether this function is really necessary. 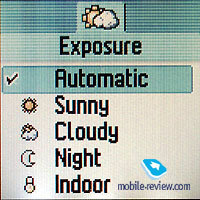 Setting of Exposure and light level settings are more important. Lighting conditions are set automatically by default, but you can manually change them. In most cases automatic settings are quite sufficient. You can select default folders where your photos would be kept. 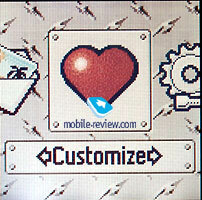 You can use received images as wallpapers or in MMS-messages. 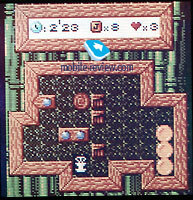 We forgot to say that you could use Frames for images of 128x128 pixels resolution. They can be ovelayed on the photos while shooting. One of the peculiarities of the phone is that you could upload frames (PNG format) from PC. So, you could create your own effects on the handset. None of the rival phones has such a possibility, though the same frames are available in many other models. 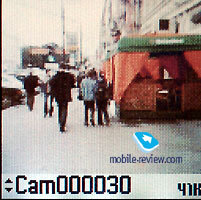 Besides, it is possible to use digiatl 8-x zoom. Just move the joystick towards yourself. It's necessary to say that software which you could dowload from the site of the manufacturer have many capabilities. Shortly we described it in Alcatel 535 review. On the contrast to other models, it's not difficult to transfer pictures on PC. You can download files one by one or all of them simultaneously. It's very pleasant that there are no difficulties to do it, the phone is really created for the sake of users, not provider's profit. Developers increased memory pool to give the user a possibility to save own pictures. Total memory pool is about 1.8 Mb. Besides, new themes of interface appeared in the new handset. One logic game - Panko was added. Your mission is to place boxes in a special order. Alcatel 735 doesn't have any problems with reception and functioning quality. They are the same as Alcatel 535. 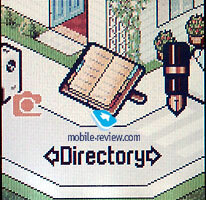 If you haven't read its review yet, we recommend you to do it now. Alcatel 735 is one of the first models in its class and it's amazing but it is rather successful. It's nice that it has a logical camera and though out interface. The quality of the images is not bad. 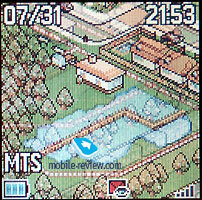 The pictures become a little bit blurred when you quickly move the phone, but there are no jerky moves on the screen. On the whole and its realization are excellent. Alcatel 735 as well as Alcatel 535 showed the best results in its class, they are one of the most functional models in their segments. The main rivals of Alcatel 737 are Siemens MC60, Nokia 3200. But these phones don't have IrDA, it is necessary to buy a cable to transfer images on PC. Besides all capabilities of the camera are much weaker in these phones. By the way, Alcatel 735 has been already sold in the shops and cost about 250 USD. Rival models will appear only in a month or later. For example, Siemens MC60 will be shipped only in the middle of October and the price for this model will be about 250 USD. Alcatel 735 will have lower price till that time and hence, more profitable. In my opinion, if you need a middle class phone with an integrated camera, Alcatel 735 is an optimal choice and wins the competition.